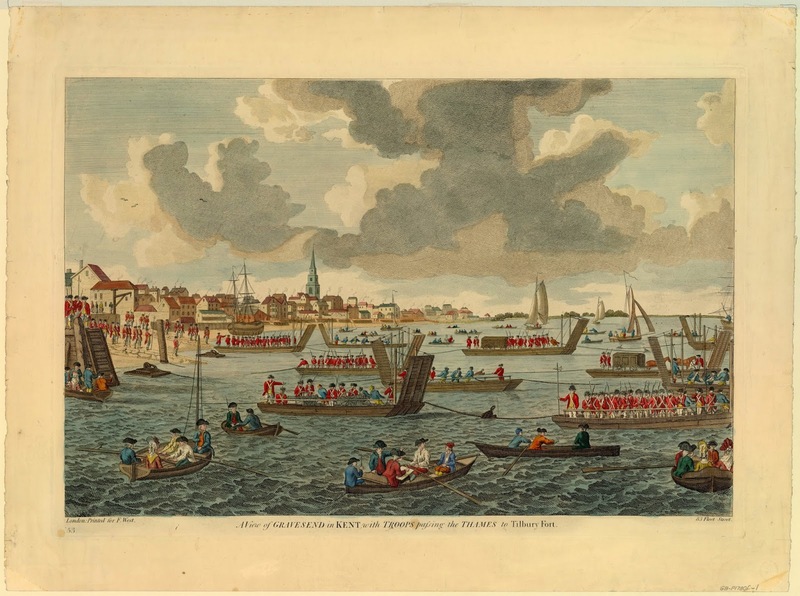 A View of Gravesend in Kent, with Troops Passing the Thames to Tilbury Fort, F. West, 1780, Brown University. Thanks to Gregory Urwin for directing me to this print! It's a colorful interpretation of the movement of a regiment across the Thames to Tilbury Fort, which still stands today just outside of London. It's a fairly routine movement for the time, but fascinating to us. In the first, the sailors and lobsters are riding aboard landing craft. Tall ramps are fitted to the bow of these flat bottomed craft so that they might be lowered on reaching shore. In this vessel, a number of lobsters stand about with their bayonets fixed. The sailors are hauling on a line fixed to the opposite shore by a large cleat. This method of transporting men was far from unheard of, and proved to be popular among ferrymen of both America and Britain. This also suggests that the distance between one shore and the next was not extreme. The sailors wear blue short jackets and breeches. Round hats make up their headwear, varying between yellow, black, and brown. We might take this with a grain of salt, as yellow seems more present in this image than may be true to life. Similarly, these sailors wear blue short jackets, yellow or white breeches, and black round hats. 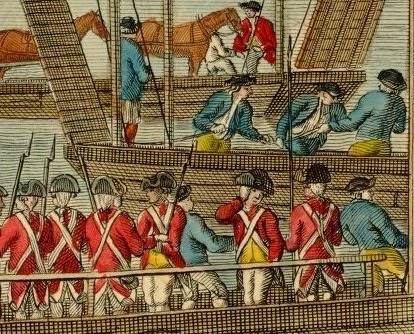 A single Jack standing at the bow of the vessel of the midground in this detail appears to be wearing slops. One might argue that these are ferrymen rather than sailors. Given the uniformity of their dress and the nature of the operation (a goodly number of vessels being dragged specifically to a military installation), I think it far more likely that these are naval sailors. What do you think?